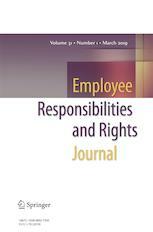 Employee Responsibilities and Rights Journal fosters development of the field of employee relations by presenting high-quality, peer-reviewed original research articles and by linking practitioner concerns involving the employment relationship with academic rigor. The journal is interdisciplinary in focus, drawing from a broad range of disciplines including ethics, organizational behavior, law, economics, sociology, social psychology, industrial and employment relations, administrative and organizational studies, and philosophy to further the understanding of both employee responsibilities and rights. The journal offers an international forum for the publication of scholarly peer-reviewed original research including qualitative and quantitative empirical studies, case studies, critical commentaries, and conceptual and dialectic presentations. In addition, Employee Responsibilities and Rights Journal publishes a Perspectives Section that showcases important contributions in formats other than the traditional research article. Such contributions include symposia/roundtable discussions, commentaries, review essays, interviews, and book reviews.